Okay, where do I even start? It has been quite the week! Lets see, let's start with last weekend. Last Saturday we had an ice storm. Yes, even here in Indiana, we get ice storms. Who'd-a-thunk? That morning we (the SO and I) got up and I finished my work. BTW - that was another stressor for that past week. We had a couple supplements due for our submitted RO1 and RO3 grants. Basically that means lots of data collecting, crunching and writing. Eh.... So yes, I got up early, finished the data, figures and writing, submitted it to my boss and then decided to go out to the store. Did I mention we had an ice storm? It was icy. And yet, we still went out. First we went to the local pet store to get more hay for the diva that allows us to call him our bunny. Then the SO did something so sweet. He offered to buy me some bread and scones! You see, I'm not a girl afraid of carbs. In fact, I heart carbs. When the SO offers to buy me scones for breakfast from the local bakery, I gush - most girls want flowers and jewelry, me I heart food. I'm a simple girl like that. After going to the bread store and ice skating our way through the parking lot I find out the SO's state of sweetness was just in lieu of diverting my anger. He wanted to buy more dvd's. I should direct you to the blog of my SO (found here). I should have known scones and bread really means the SO has become his alter ego "DVD Whore." However, I thought I'd be nice and instead of getting wicked angry, I allow him to go (plus Barn's & Nobel is next door and I needed to purchase the current issue of Verena). Plus, it was icy and the last thing we needed was an air of anger in the car while we drove the treacherous streets. Yes that is my princess. My little car. Just to let you know.... it did NOT have that huge dent in it before the 10minute bacon, onion and assorted fruit trip. Best part of all: No one was around and no one left a note. Yep, hit and run. And to top it off? Indiana does not have a "No Fault Policy". So even though I am licenced and registered in NH (car is registered there too). Even though I have full coverage. I still have to pay the damn $500 deductible because some mofo decided to HIT-AND-RUN my car. Luckily there was an officer in the next parking lot who was able to file my report asap. And I really like Geico, they were able to take care of everything. But still. Someone hits my car and I have to pay and deal with everything?!?! Basically Indiana has a high rate of hit and runs (people driving without insurance and/or a licence), and they have a high rate of fraudulent claims. Thus no "No Fault Policy." I just wish karma back onto the person who did this to my car. Good thing no one was in the car, we could have been seriously hurt! Okay, I think I vented. I am still fuming (even after a week). But I need to let go. So let's talk about knitting! I have been dying to tell you about my mom's cursed scarf. While home mum informed me she wanted a new scarf. I took her to the yarn shop in Concord, NH (The Elegant Ewe) and had her pick out a yarn. BTW - that was my second time going to that shop and I love it! 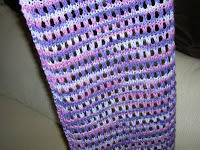 It is very nicely stocked in an assorted variety of yarns. And the sales associates are wicked friendly! I highly recommend it for any in the Concord, NH area! Do you want to know what yarn she picked out? Elizabeth Austen Andes. Ever heard of it? Nope. I hadn't either. But I figured it'd be no problem to knit with. Mum wanted just a generic scarf and this was a generic 100% wool yarn. No biggie. Initially I couldn't find anything about this yarn! 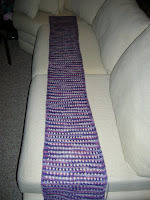 Then I stumbled onto Ruthless Knitting's blog and found this blog post. Yep that's it! 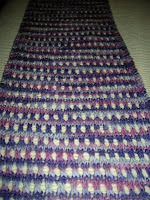 But good thing was that once I found that blog post I could look it up on Ravelry. The only identifier on the ball band is ANDES. 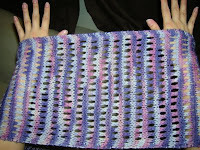 So with Ruthless Knitting's blogpost I was able to look it up and find others who have used this yarn. Thing is, it didn't really excite me. 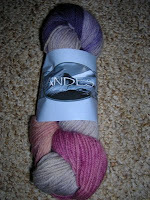 Yarn: Cursed Elizabeth Austen Andes (Actually I shouldn't say that, the yarn is nice, just not my cuppa tea). 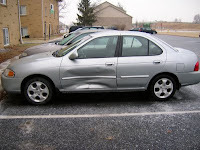 Check my blog Dec. post thie same thing happened to my car in front of my house! What kind of peolpes can do this?